Dance Legend 850 Different View. 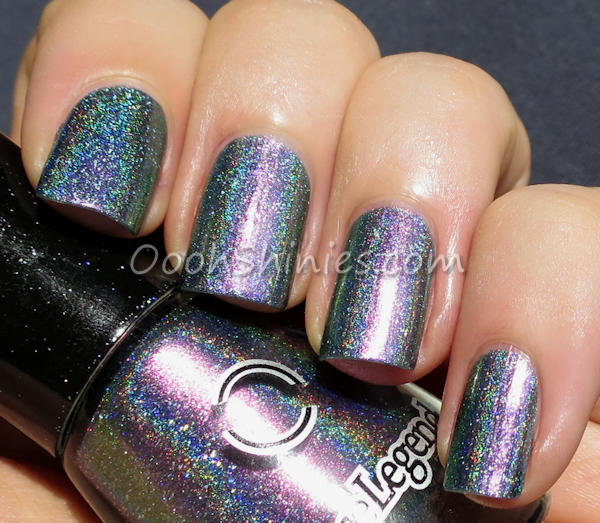 Different View is from the Holodays collection, and yet another stunner from Dance Legend! I can't get over how awesome their polishes are :) This polish applied easy, dried quick, and covered in 2 coats. Yep, another one that scores high on those points too! I'm showing it with top coat here. You can see the hint of gold on my indexfinger here, the main colors are purple and green, but I'd say there's some grey and gold in there as well. And don't forget about the bright purple popping up here and there! The holo effect is strong and also visible without sunlight at times (turns out my toilet has good daylight for bringing out the holo, lol! ), I'm so impressed with this collection! You can buy Dance Legend polish on their website, but you can also find them in webshops like Hypnotic Polish, which ships worldwide.